I wanted to start my first blog on something thats been on my mind lately, and I’m sure it’s on many of yours as well, LOSING WEIGHT & GETTING HEALTHY. A friend of mine tried this detox and gave me the idea. It’s packed with fruits and vegetables to keep you feeling full all day. Did it? Well it depends on how hungry you get, the first day was the hardest for me. My breakfast shake was great, lunch…ehhh not really my taste and by mid afternoon I was starving! Luckily the dinner drink held me over and actually tasted pretty good, fruit + cayenne pepper sounds gross but was probably my favorite of the three. Day two was easy for me because I was busy all day, and day three was even easier. The detox also advises you to take vitamins and soak in a bath of epsom salts and lavender oil which I had no problem doing. The purpose of this detox is not to lose weight but to rid your body of toxins, which it felt like it did. On the plus I did lose 5 pounds :-). After 3 days of this detox I felt great, and was craving healthy stuff, and had tons of energy! It’s been about a month since I’ve completed this detox and am thinking of doing it again. 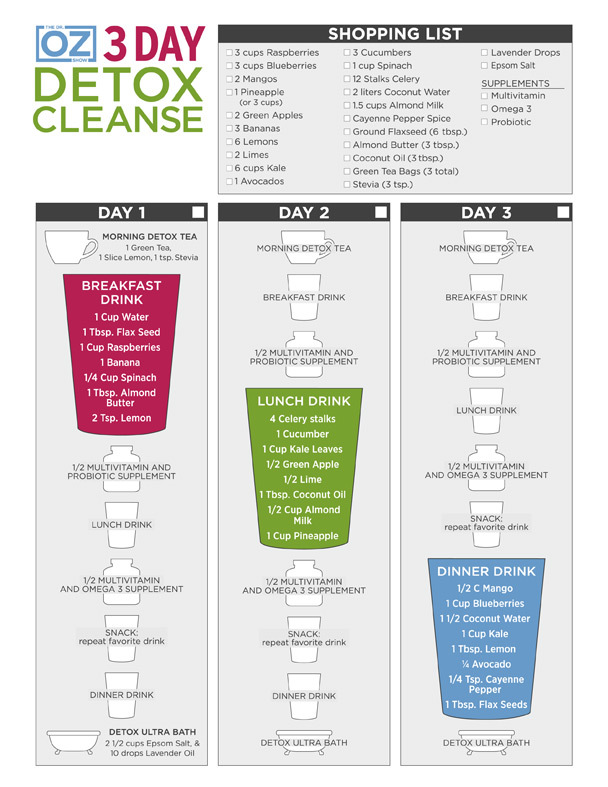 I would definitely recommend this to anyone who wants to get started on eating healthier and cleansing their body. Hey I really like this post! Just wanted to let you know about some other stuff Dr. Oz recommends, you can find it on my blog. My business has TOP NOTCH products that has helped my family and friends lose a lot of weight in a short period! Thanks for sharing! I have been thinking about trying to do a cleanse to help me curb my cravings for sugar. I think I will try it out!